Offering you a complete choice of products which include quadripod walking sticks and tripod walking stick. 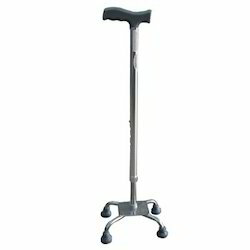 With thorough industry knowledge, we are engaged in manufacturing and supplying a wide range of Quadripod Walking Sticks. These sticks are manufactured using high grade quality steel, brass, wood, plastic and other materials that are procured from authentic vendors of the market. All these sticks are offered by us in different shapes and sizes as per the requirements of our respectable customers. We are reckoned as one of the eminent organizations, engaged in manufacturing, supplying a wide range of Tripod Walking Sticks. These are fabricated by our diligent and dexterous professionals, using high grade quality steel, brass, wood, plastic and other materials that are procured from leading and reliable vendors of the industry. Renowned for features like durable finish and high strength, these have become the preferred choice of the customers. We are offering these in different shapes and sizes as per the requirements of our valued customers.